Below you will find links to my research. Knowles, Jared E. and William Clune. (2016). “Delivery of State-provided Predictive Analytics to Schools: Wisconsin's DEWS and the Proposed EWIMS Dashboard.” WCER Working Paper. No. 2016-3, July 2016. Download here. Classification on Future Outcomes: Evidence from a Statewide Discontinuity." Journal of Policy Analysis and Management. 35:3, 559-586. Download preprint. Knowles, Jared E. (2015). “Of Needles and Haystacks: Building an Accurate Statewide Dropout Early Warning System in Wisconsin.” Journal of Educational Data Mining. 7:3, 18-67. Download here. Knowles, Jared E. and Douglas White (2013). The Wisconsin Dropout Early Warning System (DEWS) Action Guide for Educators. Wisconsin Department of Public Instruction. Madison, WI. Available online. Knowles, Jared, Andy Reschovsky, and Lindsay Amiel. “The Political Economy of Voter Support for School Property Taxation” [Under review at Public Budgeting and Finance] Available online. My dissertation examines school board elections in the United States through the lens of modern democratic theory. I develop a theory for understanding democratic institutions based on the democratic potential of the institution and the actualization of democracy. This theory helps explain the phenomenon of school boards being stable low participation elected positions characterized by brief periods of intense political action. 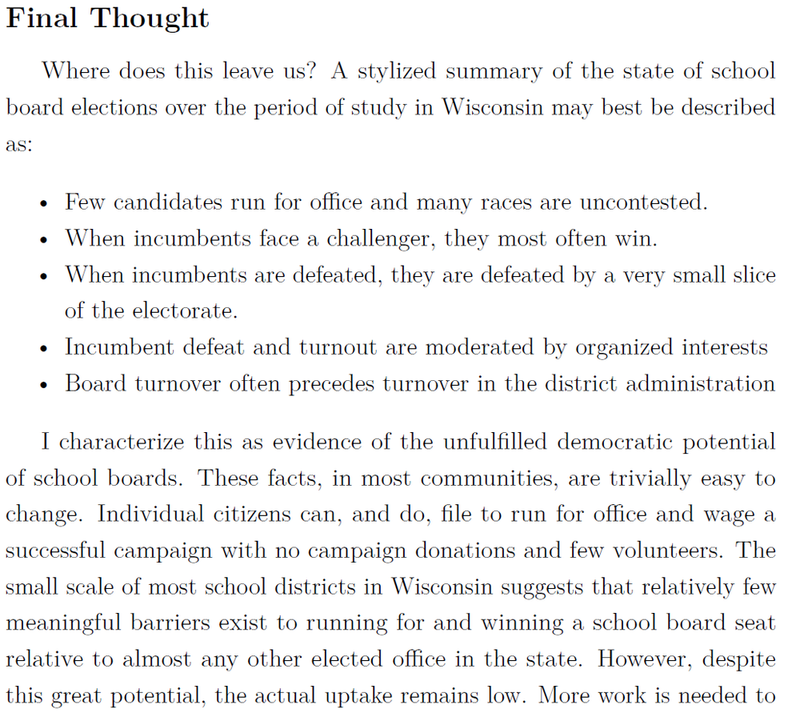 I analyze nearly all school board elections in the state of Wisconsin over a sustained ten year period of study to explore both the way school board election participation varies between places, but also within school districts over time. What conditions lead to challengers running for school board? What conditions lead to increases or decreases in voter turnout? What, if any, sensitivity does school board electoral activity show to larger political shifts? What consequences do school board elections have for policy in school districts and outcomes? The gallery below shows some of the figures from my dissertation that best illustrate my results. Few candidates run for office and many races are uncontested. When incumbents face a challenger, they most often win. When incumbents are defeated, they are defeated by a very small slice of the electorate. Voters, with little media coverage of school boards or the school board campaign, have relatively few avenues of acquiring the information necessary to cast a meaningful ballot and largely choose to simply opt out and implicitly endorse the status quo. It is hard to imagine an event within the current organization of school boards that could better provoke the public to care about school board elections than the events in Wisconsin from 2010-2012, and yet the impact on participation was negligible. This lack of mutability in participation is troubling evidence against the likelihood of fulfillment of the democratic potential of school boards. If you are interested in learning more, you can read my dissertation abstract. Or, get the full text right here. Another area of focus for me has been doing applied policy analysis leveraging administrative data. I spent five years as a research analyst inside the state education agency of the state of Wisconsin and during that time I conducted a variety of quantitative policy analyses. Check out the presentations page for some summaries of this work.